Written from a hands-on approach from for hands-on learning, The Art Of Surveillance covers different techniques, skills and knowledge needed to conduct a professional surveillance. The work coves equipment needed, types of surveillance, how to handle face-to-face contact with the subject, dealing with other PI's when out-sources cases, writing a professional surveillance report, marketing your services and the legalities of surveillance today. 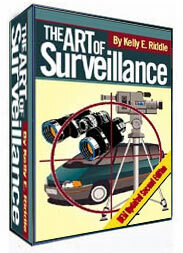 Complete with diagrams, this intriguing book gives the "rookie" or an expert great tips and techniques for those serious about surveillance. temporary link to download it in a PDF File.